A transporter accident sends Sisko, Dax, and Bashir back in time to San Francisco in 2024, shortly before a massive riot triggers enormous social change in America. One of the big risks of having the Defiant is that the show might lose the one thing that makes it unique: its immobility. Here, we see almost all of the regular cast members visiting far away Earth and having an adventure akin to those of the Enterprise. 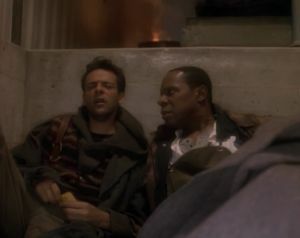 Still, the episode manages to keep its identity as DS9 through its murky subject matter. Who's running Deep Space Nine? Dax is a lot quicker to recognize and adapt to the situation she's in. Sisko and Bashir take a painfully long time to figure it out, but after just a few seconds, Dax is already constructing a cover story. O'Brien says the transporter beam was redirected through "time, not space," but it's fairly rudimentary science that they are the same thing. Besides, even if you accept O'Brien's premise, how do you account for the constant movement of the planet, the solar system, and the galaxy? If they rematerialized in exactly the same point in space but at a different time, there's no way they'd be anywhere even remotely close to San Francisco. Why aren't the changes to the timeline instantaneous? Why, in the present, do the alterations from the past wait so long to happen? This episode has a fairly standard time travel set-up--very similar to the premise of "The City on the Edge of Forever"--but it still manages to shake things up by showing us a time period we haven't seen before. By offering a near future that is a bit dystopic, it manages to comment on current events without being too obvious about it. Though the idea of Sanctuary districts is pretty extreme, the tension between the haves and have-nots is prescient. I appreciate, however, that Sisko is careful not to judge the time period too harshly, acknowledging that there are economic realities that lead to it and offering some moral nuance that could have easily been overlooked. Bashir gives voice to one of the main underlying themes of Deep Space Nine when he worries about whether humanity's ideals can stand up to rough times, scarcity, hunger, and less technology. Quark does an even better job when he says something similar about humans in "The Siege of AR-558."